High above the lush green valley floor where deer come to drink from the waters of Hamma Hamma river there is a small alpine lake nestled among rugged peaks, talus fields and waterfalls. Sounds idyllic? It is. You can sit there for hours listening to the music of flowing water while sun kisses the hillsides above you. Or if you are not into camp chilling time you can climb the grassy or rocky slopes above the lake for magnificent views. Either way you will feel like you found a little piece of heaven on Earth. But to get to heaven, you will have to break some sweat first. 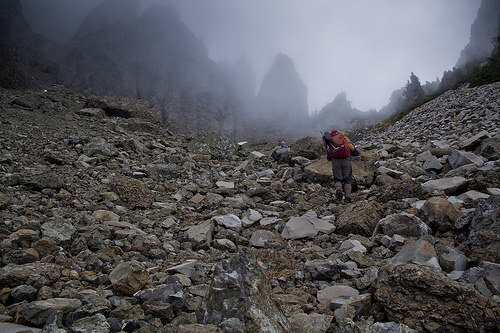 The trail to Lake of Angeles is not an easy one. It starts steep, gaining 900 feet in the first 1.3 miles, and it gets steeper. 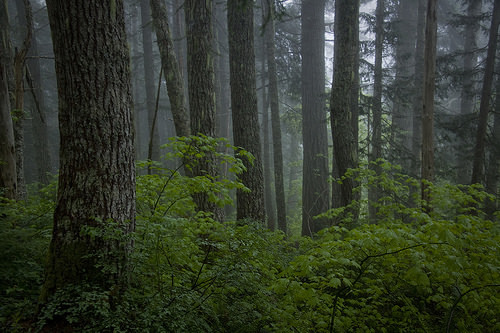 At first the trail meanders through the mossy covered forest which is typical to the Olympic Peninsula and crosses few impressive ravines. Do not expect bridges aiding such crossings. You will have to do it the hard way – by climbing down and back up. After a while you meet an old overgrown logging road. From here on you are likely to encounter slippery loose rock and dirt and the steepness increases to 1,100 feet gained in the next 1.1 miles. The crux of the trail can be found above this section. You will have to use your hands to scramble up roots and rock also known as the Headwall. There is a drop off of several hundred feet here that can make some people experience vertigo but the rock is slanted towards the trail and even though challenging and not suitable for most novice hikers this section is not dangerous if the rock is dry. The hard work is now over and you can enjoy meadows bursting with wildflowers. It’s tempting to look for a campsite here in the peaceful Valley of Heaven and you can certainly do so but the final destination is now so close it would be shame not to make it all the way. The trail can be little hard to follow here as many climbers and animal paths exist. Keep northeast and you will find the correct one. 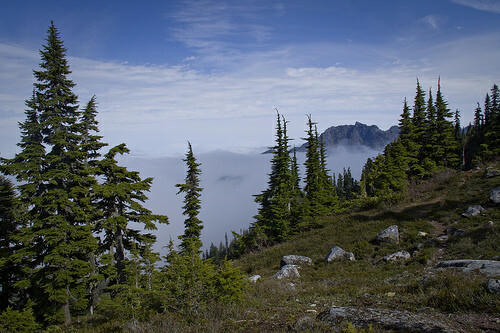 Meandering through the meadows, watch for deer, marmots, mountain goats and even bears can sometimes be seen here but even if you are not lucky to spot wildlife, the views of Hamma Hamma River Valley you just climbed from will wow you. 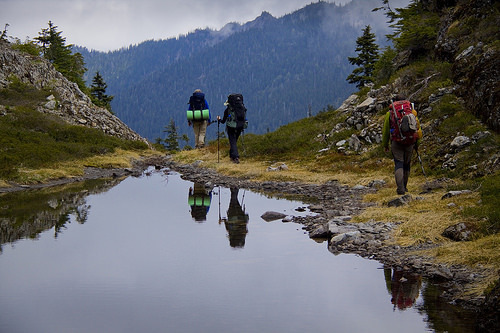 Soon after you cross the meadow the trail enters Olympic National Park and you will climb your last hill. It’s steep but short and the tread, apart from couple slightly wash-out spots, is decent. 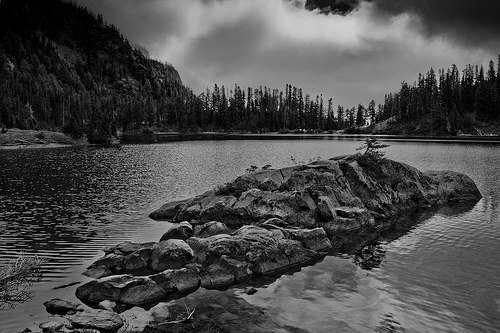 Few more steps and you will find Lake of Angels perched in an open basin. 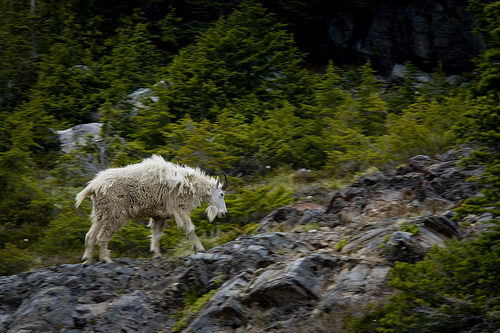 The lake is home to mountain goats, you can often see them roam around the shore or graze on the slopes above, and marmots which can usually be heard far before they are seen. 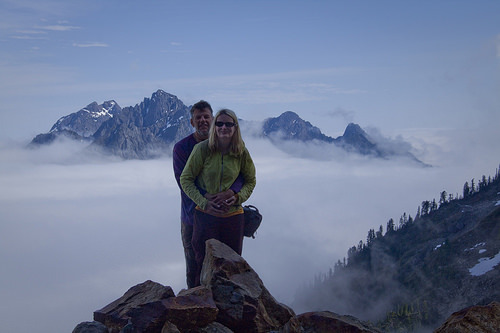 Most people make this an in and out hike for total of 7.4 miles round trip and approximately 3,400 feet climbed. 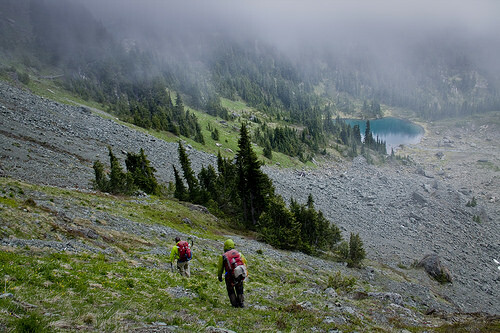 Our plan is to camp for the night and continue towards Upper Lena Lake via St. Peter’s Gate, a pass that from any angle looks so steep I doubt it’s attainable without rope. The afternoon feels like summer and after setting up camp we decide to scout the route. The climbers path to St. Peter’s Gate starts from Valley of Heaven some 300 feet below the lake. 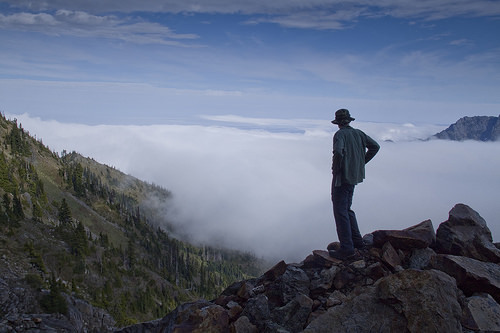 There might be a possibility to traverse higher up and that’s the area we set out to explore. 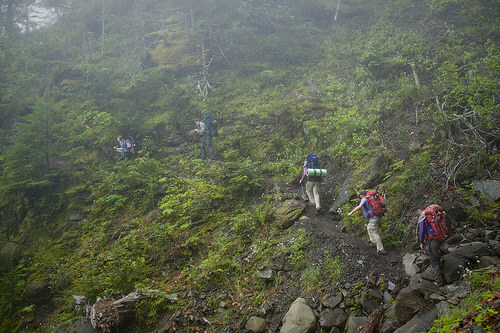 The grassy slope is easy to negotiate but after bypassing cluster of trees we find ourselves in the rocky terrain. The scenery is absolutely amazing and we keep going even though a decision was made we will not go this route with consideration to some members of our party who seldom scramble. 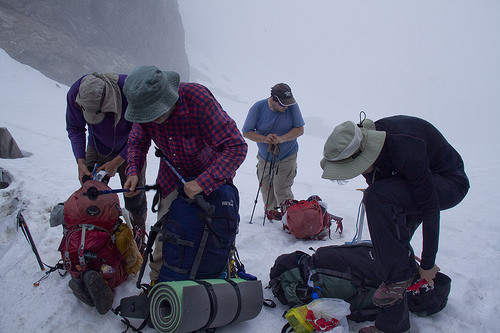 They would probably curse us for a long time if we had them carry overnight pack over the boulder field. The climber’s path has it’s challenges also. It requires a short bushwhack through brushy trees. An evergreen fell covering part of the path and it’s either to climb over it or bypass through the maze. As it turns climbing over is easier. 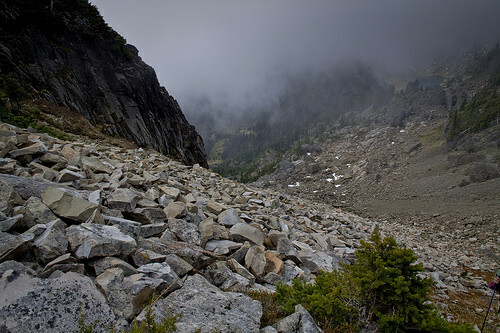 Significant portion of the route crosses and climbs talus field. Luckily this talus is relatively stable and the ascent that from afar looked so insanely steep is gained on a reasonable grade. It’s a moody kind of a morning with clouds rolling through the landscape and obscuring most of the views. On occasion Mt. Stone makes a brief appearance half shrouded in the fog. It’s mysterious. It’s sullen. It suits the area well. Snow lingers on the other side of St. Peter’s Gate. We take the bench angling away from the gate and run the snow as far as we can. The snow makes it easier and faster to descent. Eventually we hit bare ground again and descend the last several hundred feet to saphire colored Stone Pond. If we had an extra day I would propose camping here. So much could be explored in this beautiful basin. 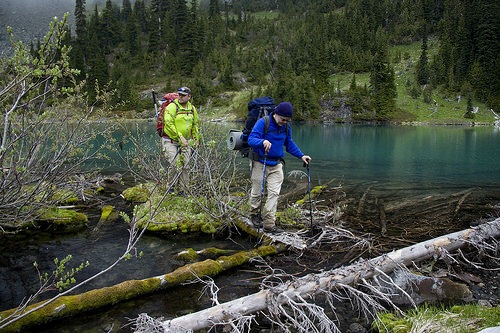 Today; however, we have to cover more miles and after crossing the outlet on a series of logs we are off to find our way through the bushes to a saddle from where we can pick a faint boot path which would lead us all the way to Upper Lena Lake. 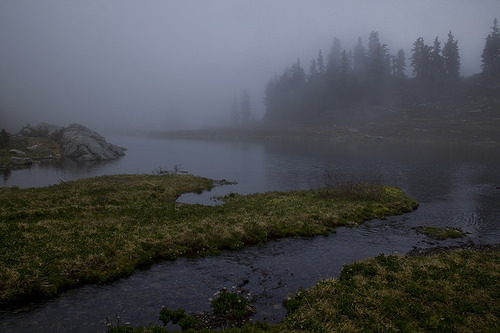 Camping at Upper Lena Lake requires permit. We don’t have one and for that reason we decide to camp on the ridge couple miles from the lake. Our site sits little bit above the path and on one side offers a view of emerald green tarn while on the others we can see all the way to St. Peter’s Gate. If we look closely we can pick up our tracks in the snow. There is no scrambling involved in the last day of our adventure. 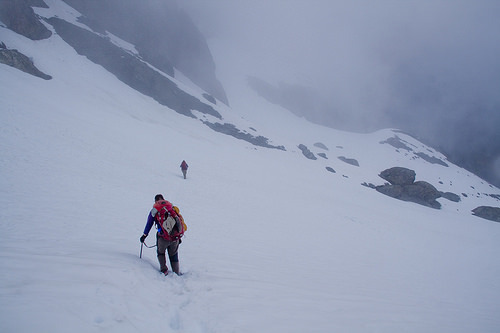 The path meanders along the ridge for a while and then takes us over where it starts dropping towards Upper Lena. Once or twice we have to find our way through sections where the path is overgrown. Otherwise route finding is quite straightforward here. The slopes are covered with flowers. Avalanche lilies are in their prime and they are plentiful but other varieties can also be seen. Red and pink indian paintbrush and purple lupines are among the more common, lower down white blooms of trillium and dogwood line the trail. Several tents line the shore of Upper Lena. The lake is beautiful. It sits in an alpine meadow surrounded by flowers with Mt. Lena and Mt. Bretherton looming overhead. This is where we pick up an official trail again. It is an adventurous trail at first climbing over roots and drainages. There are some steep section and some blowdowns to deal with and in a way we move slower here than we did while following the ridgeline. 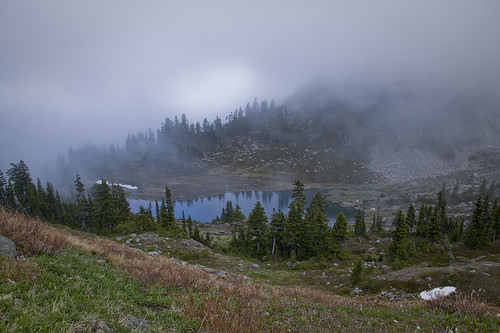 The conditions change when we reach Lower lena Lake, a popular day hike destination. It’s busy, as we expected it to be, and the chattering and excited voices of day hikers betray the location of the lake long before we can see it. The trail from Lower Lena is a highway comparing to those we walked on during the rest of our adventure and cruising down to the parking lot is a breeze. I definitely agree with you, this looks like a little piece of heaven on Earth! Your photos are breathtaking. All these small ponds up in the alpines are beautiful and their colours are just wow. These are the types of terrains I love. Great post!